Cats, mysteries, coffee, chocolate, books, small town romance…Meow Mayhem has it all. What does it take to write a cozy mystery? Naturally, all of the above. The crime, often a murder, is offstage, meaning it happened before the book began, or happens outside of the reader’s purview. It’s usually bloodless, or at least not too graphic. The crime, typically, is unusual, but not too unusual that a small town police department couldn’t handle an investigation. But that’s where they’re wrong, and amateur sleuths are born. The amateur sleuth is a person who has a vested interest in solving the crime, and has little or no professional police procedural training. The sleuth makes an effort to get to the bottom of the problem and often involves his or her friends. 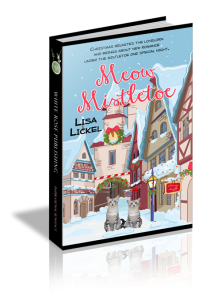 In the Meow Mysteries, Ivy and Adam have been invited to relocate by the mayor of a small town who has been granted several million dollars of revitalization money. They are both ready to make a fresh start and willing to help out their friend, a fellow cat lover, with who they connected through their pet fancier society. But after Ivy and Adam get settled in Apple Grove, their friend goes missing. There’s attraction, confusion, miscommunication, secrets, and chocolate involved in solving the mystery of the missing mayor. But best of all, there are cats—Egyptian Maus, to be exact; the only spotted domestic cat. Isis and Memnet are actively involved in the case, as well as carry on a little secret romance of their own. Ivy and Adam have a lot at stake, not to mention each other, and have a serious decision to ponder when they learn the fate of their friend. Leave? Or stay and make Apple Grove home.